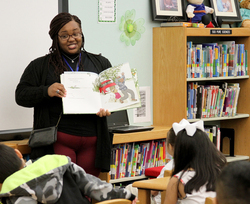 Stephen F. Austin State University senior Melanie Lynch reads "Anna Hibiscus' Song" by Atinuke and Lauren Tobia to a group of Brooks-Quinn-Jones Elementary School students during the National African-American Read-In. SFA students and faculty members also read poems to students at Nacogdoches High School. NACOGDOCHES, Texas - As giggles hush in the library of Brooks-Quinn-Jones Elementary School, Stephen F. Austin State University senior Melanie Lynch begins reading "Anna Hibiscus' Song" by Atinuke and Lauren Tobia. Recently, SFA students and faculty members participated in the National African-American Read-In, an event promoting diversity in children's literature and highlighting African-American authors. This is the second year SFA has participated. "I love being involved with the students and helping improve their educational experience," Lynch said. During the read-in, SFA students and faculty members read to students at B.Q.J. Elementary School and Nacogdoches High School. Dr. Lauren Burrow, assistant professor in SFA's Department of Elementary Education, organized the read-in at the elementary school, while Dr. Heather Olson Beal, associate professor in the Department of Secondary Education and Educational Leadership, orchestrated the high school event. "The read-in is good for my college students to see how they can make books relevant and connect with their students through characters, authors and the storyline," Burrow said. "It's also great to see the elementary students respond to the story and feel good about themselves." "Anna Hibiscus' Song" focuses on happiness and how people express their joy. High school students learned the importance of valuing oneself and others by reading poems from Langston Hughes, Clint Smith, Nikki Giovanni and Kerry Jackson. Students also viewed a video of SFA alumna Nytesia Ross presenting spoken word poetry. "It's important for students to know their voices matter and that they can use their voices to change the world like the African-American authors whose works we engaged with as part of the read-in," Beal said.